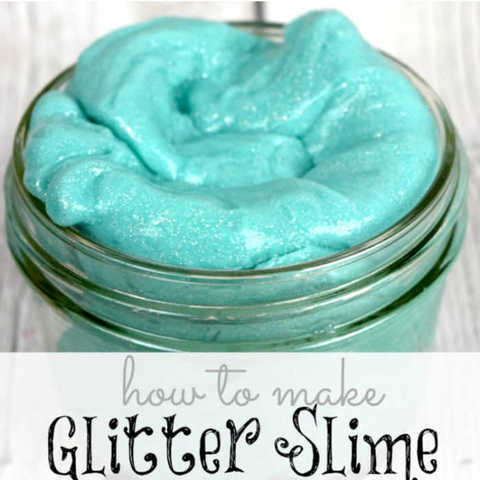 I have a fun craft project to make with the kids today – Glitter Slime. You can have all the fun of slime with the sparkling glitter inside. Boys and girls love it. We made it in a teal blue so it looked more Frozen Inspired for my princess, but even the boys loved it. I mean…. who doesn’t like slime right? Next time it is too hot to play outside or if it is a rainy day you just have to make this fun idea with the kids. Making slime is all the rage around here. Seriously that is all the kids want to do. We have been making slime and recently wondered if we could put glitter in it. We gave it a try and the results were just fabulous! How much glitter do I add to slime? This is a personal preference and based on how much glitter you prefer. Just keep in mind that you do not want to go overboard because it will get on your hands when playing with slime. So you want enough to make it sparkly but not so much that it is a mess. Everyone loves slime so DIY Glitter Slime is sure to be a hit! 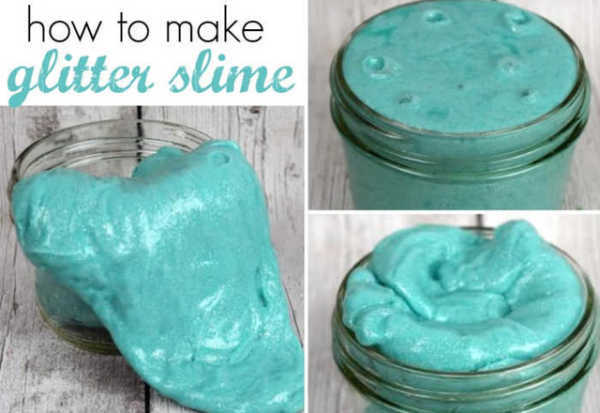 If you love making this, be sure to learn how to make slime for kids that is calming. It is just as easy and so fun to make. 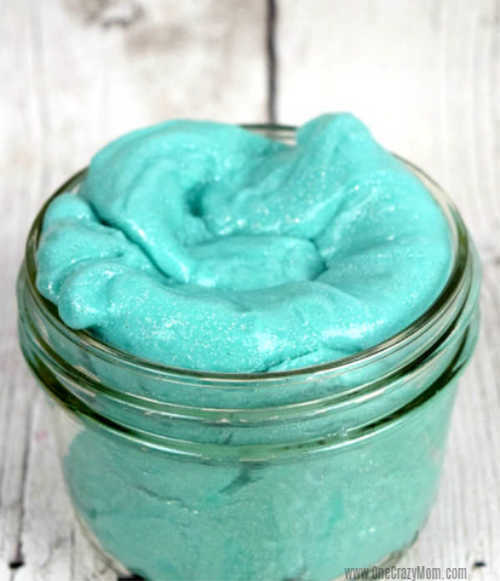 Another favorite around here to make is Valentine’s Day Homemade Slime. You really can make it year round and it looks so pretty. The best part is how easy and frugal it is to make. This won’t break the bank, but can give you many afternoons of fun. Glitter Slime is the perfect activity especially on rainy days and snow days when the kids are about to bounce off the walls. Let’s get started making DIY Slime with glitter glue! 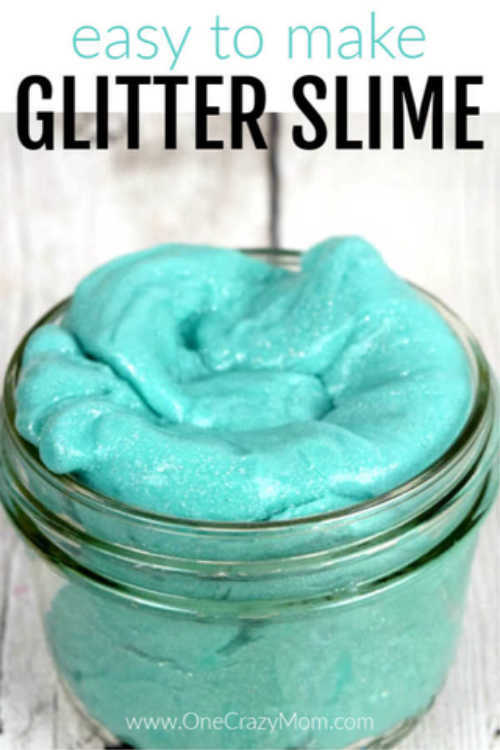 How do you make glitter slime? Grab a small mixing bowl and pour in 1 cup of warm water and 2 tsp of borax powder. Stir until well blended. In your medium sized mixing bowl pour in your entire bottle of elmer’s white glue and pour in 1/2 cup of water. Stir until well blended. Once the contents are stirred together in the glue mixture, add in 5 drops of blue food coloring. Mix the drops of food coloring into the other ingredients. Pour in a lot of glitter and stir it together with your glue mixture. You might want to start with the glitter in small amounts. You can always add more glitter but can’t take it out if you get too much. Now pour in the contents of your small bowl right into the middle and wait for the products to become solid. Grab both your hands and start squishing the slime together to make it more solid. Form it up in a ball away from the liquid and pour out the contents into the sink. The slime is now ready to play with.Note. If sticky add more activator (borax or boric acid) to the slime. Just keep in mind this cannot be directly added but the borax needs to be combined into warm water before adding to slime mixture. Once you’re done playing with the slime, store it in in a container to keep it fresh. 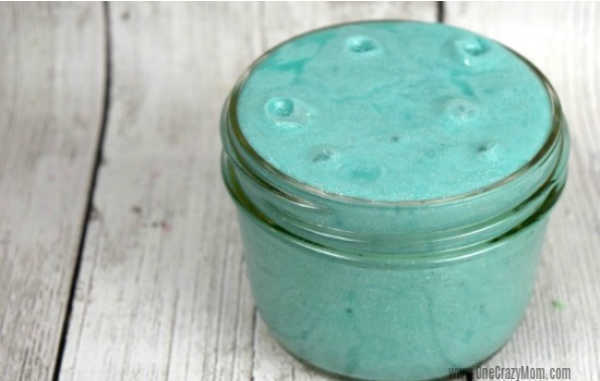 How to store DIY Glitter Slime? I like to store the slime in a mason jar or ziploc baggie to keep it fresh. You can use what you prefer. 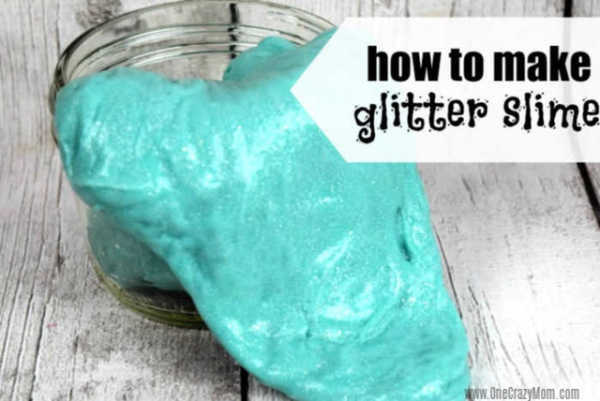 How to make glitter slime without borax? You can use baking soda and contact lens solution instead of borax. This will act as an activator. Another activator is liquid starch. How to make glitter slime with contact solution? 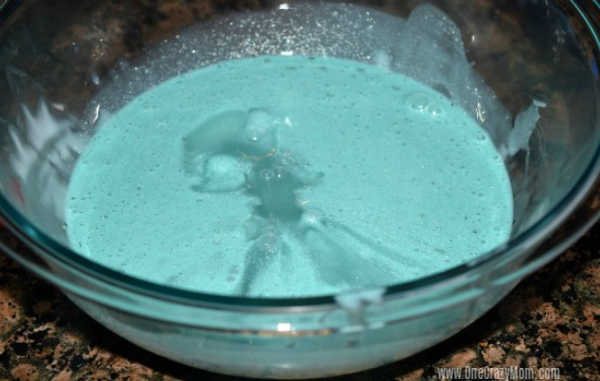 Just substitute contact solution for the borax (sodium borate) to make slime. This is perfect if you do not have borax on hand. 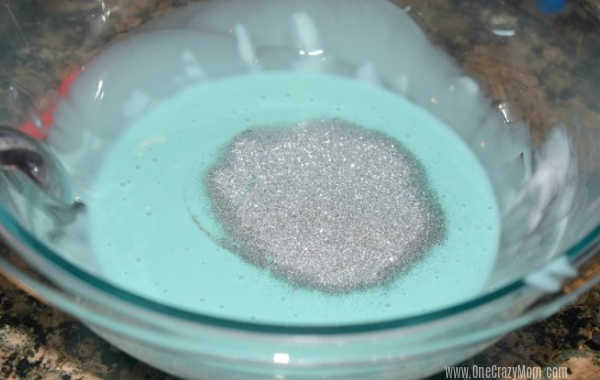 How to make slime with glitter glue and baking soda? 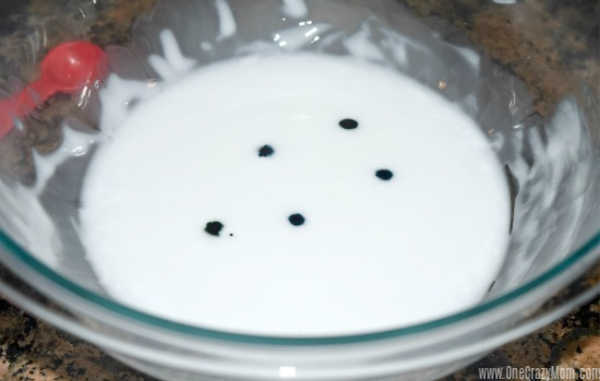 Just combine baking soda with contact solution and you can easily make glitter slime! You can also use Elmer’s glitter glue. What ingredients make the best slime? Lots of ingredients can make slime but my favorite ingredients include: glue and borax. Change it up and make different colors – green, pink, purple, and even yellow just by using different food color. So fun! We have a blast making new things and it is so budget friendly. Whether you need a rainy day activity or just want to DIY together, Glitter Slime is a great activity. Everyone will have so much fun! The kids enjoy it and everyone creates precious memories. Let us know if you this DIY Glitter Slime! It is sure to be a hit. Since it is budget friendly and easy, you can make this often. The kids will think you are the best! It is so easy and frugal to make homemade bubbles and your kids will have a blast. Learn how to make glue and save a ton of money on your craft projects. This was so confusing and did not work. Step 1 says to add glue, then step 2 says to add glue…. What? It didn’t work at all. Bummed. Rebecca – Thank you for letting me know. I have corrected the post. I hope you try it again! I had to make slime a few times to get the hang of it.